Dr. Clint Buchanan is a life-long resident of Trenton, TN. He completed his Bachelors of Science degree at the University of Tennessee at Martin. He graduated from the University Of Tennessee College Of Dentistry and joined Elite Dental Care in 2005. He is a member of Tennessee Dental Association (TDA) and American Dental Association (ADA).As a general dentist, Dr. Clint enjoys all areas of comprehensive dental care from preventive treatment and simple restorations to root canals, crown and bridge work, implants and cosmetic care. Providing the most advanced dental care in a comfortable and pleasant atmosphere are his priorities. He works closely with all patients, children and adults, to create life-long dental care plans that promote daily attention to good oral health in Trenton, Jackson, and Germantown. Dr. Clint Buchanan is a passionate dentist who is committed to providing patients with high-quality restorative and cosmetic procedures. His extensive training allows him to perform advanced dental treatments. Dr. Clint remains abreast of the most advanced dental care procedures while utilizing state-of-the-art technology, supplies and equipment. He has completed multiple courses from Spear Education specializing in cosmetic dentistry. He is a graduate of the Comprehensive Implant Residency Program in Birmingham, Alabama. 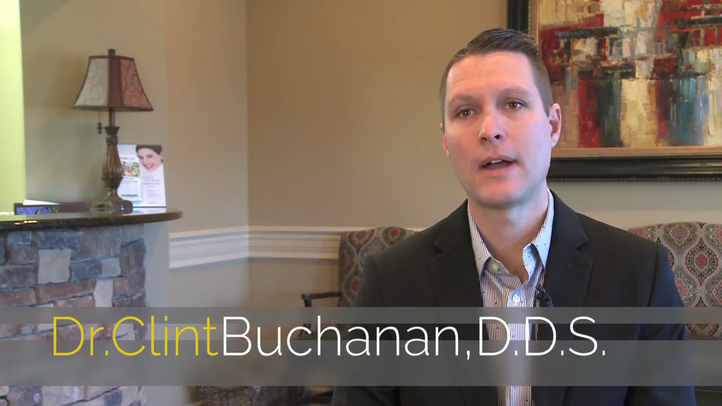 By placing dental implants, providing cosmetic dentistry, sedation dentistry and general dentistry, Dr. Buchanan creates smiles that last a lifetime. When Dr. Clint is away from work, he values being a good husband, father and community member. He is married to his high school sweetheart, Cicily Abbott Buchanan and they have two children, Grey and Lily. He is an active member of the First United Methodist Church. He enjoys cheering on the Tennessee Vols, traveling and spending quality time with his family and friends.